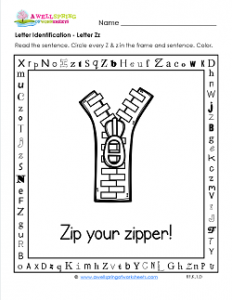 Kids need to recognize the letter z and this letter identification worksheet can help with that. A great big zipper is pictured in this lettered frame. “Zip your zipper.” is the sentence. Kids look for uppercase and lowercase z’s in the frame and the sentence and circle them. The letters are in all kinds of fonts so kids may have to look closely. There are three z’s on each side of the frame with a total of 12 and two in the sentence, which makes 14 in all. Look for the hidden sight word in the letters of the frame, too. For you teachers and parents, it’s the word “he” in the top part of the frame. Go to this page to see all the letter identification worksheets in this set.